Mr. Sherrerd is a statistical data analyst with a background in communications engineering and large-scale computer applications. Many readers of Velikovsky's writings and associated papers perhaps find it very difficult to accept the historical reports of prolonged periods of daylight or darkness, as if "the sun stood still," or as if temporary but very severe perturbations occurred in the rotation of the earth about its polar axis. One would think intuitively at first glance, that such occurrences would require impossibly large angular decelerating and accelerating forces, which in turn would so totally disrupt the earth's crust as to make impossible any human survival. Sudden and major displacements in the geographical position of the earth's polar axis would most likely require such unthinkable circumstances. Those geographical shifts which have occurred during historical time involved at most a few degrees of arc distance on the surface of the globe, and were indeed tectonically quite disruptive at that. However, unusual changes in the sun's apparent position in the sky would also result from major shifts in the celestial position of the poles, i.e., the direction of the earth's spin axis in the celestial sphere. These could occur without large angular decelerating and accelerating forces and without major tectonic disruptions, by the phenomenon of gyroscopic precession. 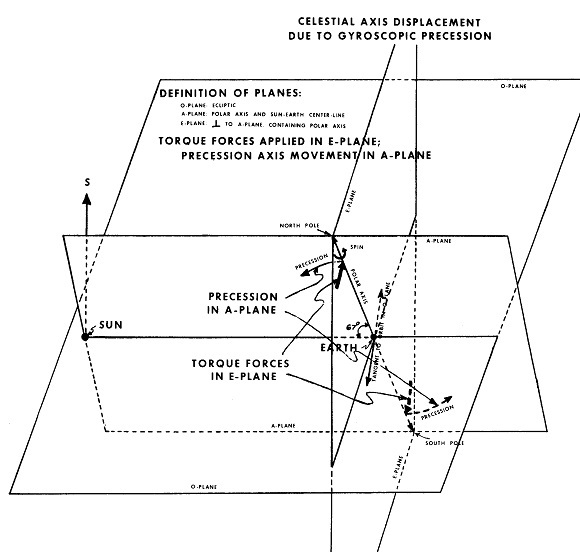 Since gyroscopic precession involves a temporary transfer of angular momentum from spin to precession, when beginning and terminating it moderately affects the rate of rotation of a spinning object and introduces small horizontal forces on points on its surface; but it significantly shifts the absolute orientation of the spin axis in space as long as the precession continues in effect. The causal forces necessary for such a shift are indeed large, and must appear as a torque applied to the earth's polar axis. Magnetic, electrostatic, and gravitational forces in combination could give rise to such a torque, and such would be a likely consequence of a "near collision" of a large comet with the earth. The effect of either Pole precessing toward the sun is an expansion of the Arctic and Antarctic Circles to encompass lower latitudes, ultimately to the equator. If the torque is sufficiently strong that the angular rotation rate of the precession is of the order of magnitude of half the angular rotation rate of the earth's spin, is timed during the Summer months, and is directed such that the North Pole precesses toward the sun, then points in the Northern Hemisphere in the morning daylight hours when the precession begins will indeed observe a prolonged daylight period, and points diametrically opposite on the globe will correspondingly observe a prolonged night. Velikovsky cites ancient Hebrew, Chinese, and other records of both apparent phenomena. An example of this is suggested in the illustration. Let (O) be the plane of the earth's orbit about the sun (i.e., the ecliptic); (S) be a reference direction vector perpendicular to (O) through the center of the sun; (A) be a plane defined by the earth's polar (spin) axis and the sun-earth center-line; and (E) be a plane containing the earth's polar axis and perpendicular to (A). (Except for the exact moments of Winter and Summer solstices, the earth's orbital velocity vector will not be coplanar with (E).) Then, if a torque represented by a force moment or couplet lying entirely within (E) is applied in the direction illustrated, the polar axis will precess entirely within (A) and directed such that the North Pole shifts toward the sun. From the theory of gyroscopic precession of a rigid body, it is a simple matter of estimating the force moment or torque required. Using s = 7.29211 x 10-5, sec-1 as the earth's spin velocity and I = 8.11992 x 1044 gm-cm2 as the earth's moment of inertia, the torque required to give a precessional spin velocity s' equal to s/2 is given by t = Iss' = 2.15888 x 1029 newton-meters. It has been suggested that perhaps an extra-terrestrial magnetic field acting upon the earth's magnetic field could give rise to a precession of the earth's celestial axis. But if the present value of the earth's magnetic dipole moment of u = 6.4 x 1021 ampere-meter2 is assumed, the strength of the external magnetic field required to exert a torque of this magnitude on the earth is B = t/u = 3.368 x 1011 gauss. Even if the earth's magnetic dipole moment were several orders of magnitude greater in the past than it is now, it appears that the required magnetic field strength is well beyond that which is reasonably conceivable as the sole source of this torque. However, gravitational and electrostatic forces could conceivably give rise to torques of this magnitude. If a large comet were momentarily "captured" in a local sub-orbit about the earth with perigee slightly beyond the Roche limit and in a sub-orbital plane tilted with respect to the earth's equatorial plane (for example, in the illustration, in a sub-orbital plane which is approximately perpendicular to the (E) plane but neither perpendicular to nor coplanar with the (A) plane), then a fluctuating torque would be exerted with two maxima during each sub-orbit in such a way as to cause a positive cumulative precession effect of considerable magnitude. Such gravitational/electrostatic forces would also somewhat affect the earth's orbit about the sun, the spin rate (length of the day), and the geographical position of the earth's spin polar axis, undoubtedly also with accompanying major tectonic disruptions. Historical records establish that such phenomena have occurred. This simple model of course can only suggest orders of magnitude, since many unknown orbital and rotational characteristics of the earth and other celestial effects pertaining at the historical times of interest have been ignored. Furthermore, it is most likely that magnetic, gravitational, and electrostatic forces were all involved in concert. Nevertheless, such phenomena are quite plausible within the present knowledge of astrophysics. It is intellectual dishonesty to dismiss the historical records on the basis of alleged astrophysical impossibility. A more fruitful endeavor would rather be to explore what quantitative models are consistent with the historical records and what other logical conclusions can be drawn from such models.